1. Pick up a magazine and read up on the basics, look at the pictures, maybe even learn what looks are best for your body type. A year's subscription is really inexpensive these days, and it will keep you up to date and on top of the trends. 2. Look for a role model you can emulate. Maybe it's your boss, or a character from your favorite TV show, perhaps even a sports celebrity explaining his recent indiscretions at a press conference. Whomever it is, pick someone and study their look. Pay attention to the details and verbalize why you like their particular style so you can then repeat what you want to your clothing salesperson or tailor. 3. Go to a store and try stuff on. Grab something you may not normally wear and see how it looks on you. You might find something you like. 4. Hire an image consultant. They have already read all the magazines and done the research for you. They aren't as expensive as you might think and they'll save you money by preventing you from buying the wrong stuff. 5. Be conscious of the image you are portraying to other people. How do you want to be perceived by people who don't know you? If none of that helps, then just come in and ask me. I'll be glad to tell you what you want! Why do they call them "sport jackets?" If you're worried about looking uncomfortable in a jacket at your next interview or important meeting, it's probably because you don't wear one often enough. Anyone can wear the clothes, the trick is looking cool when the heat is on. As the saying goes, "practice makes perfect" and it applies to looking cool too. "How can I do this?" you ask... 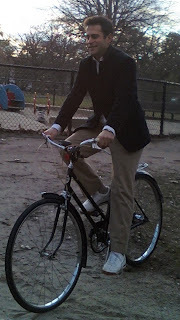 It's easy, just start wearing sport jackets everyday, no matter what you're doing. Grocery shopping? sport jacket. Cutting the grass? sport jacket. Riding a bike? That's right...sport jacket. You will be utterly amazed at how much stuff you can hide in the inside chest pockets. It's kinda like cargo shorts, but more grown-up. You'll also be amazed at how much attention you'll garner from the ladies. You may not notice her new hair style but trust me, she will notice your jacket. Remember it's not hard to be the best dressed guy in the room, even if you're riding a bike. Always button your pants before pulling up the zipper! Closing the zipper first could place pressure on the teeth and easily damage them. If your zipper is stuck, don't force it! Forcing it will most likely damage the key or teeth. Remove the garment carefully without forcing the zipper and bring it in. Suit jackets should only be dry cleaned when absolutely necessary. In general, as little as possible. Air out your garment to remove odors before storing it in your closet adn buy a fabric brush to remove lint or light dirt. make sure wool clothing is clean before storing for the season as moths are attracted to food and perspiration stains. Use natural moth detterents like aromotic cedar as they are less offensive to humans than moth balls (yuck).